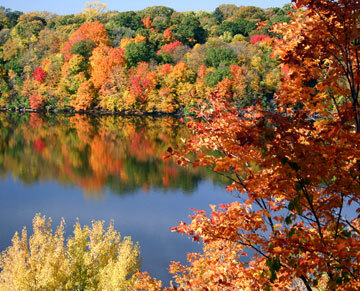 The Northeastern USA is said, best in the world, for breathtaking autumn colors. Upstate New York where I was three years in the military -- was spectacular. But even here in the Northwest many many spectacular, gorgeous, colors are seen as deciduous trees put on their color display and prepare to shed leaves. The Great Creator could have just let them get ugly looking and fall off. But praise be to him - maybe he figured we all needed some last minute cheering up before the dreary days of winter, as some might find them. God is glorified in displaying his immense intelligence, power, and creating skills. Photosynthesis, at the heart of this amazing color display, is immensely complex. Special pigment, chlorophyll, gives the normal summer green color. Other special pigments called carotenoids give the fall orange-yellow colors. 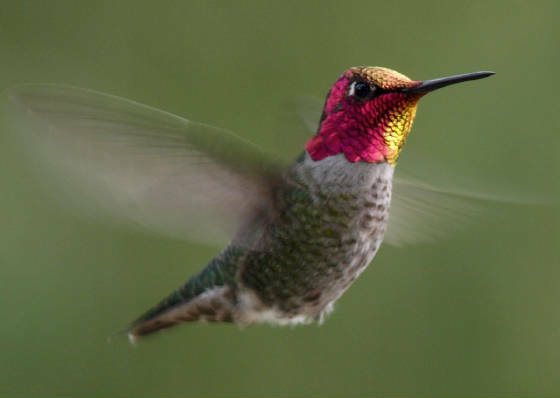 The combinations and interactions of these pigments, day and night lengths, temperatures, precipitation, and other factors combine, making this a very intricate phenomenon. No way is this the product of random chance evolution. "Autumn leaf color is a phenomenon that affects the normally green leaves of many deciduous trees and shrubs by which they take on, during a few weeks in the autumn season, one or many colors that range from red to yellow. 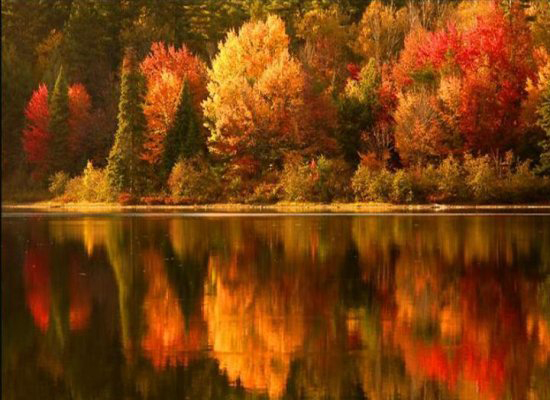 The phenomenon is commonly called fall colors and autumn colors, while the expression fall foliage usually connotes the viewing of a tree or forest whose leaves have undergone the change. 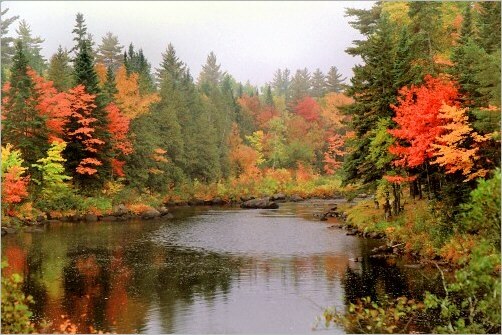 In some areas of Canada and the United States, "leaf peeping" tourism is a major contribution to economic activity. 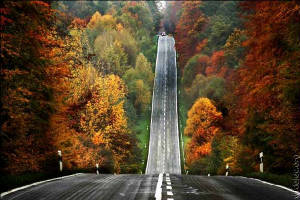 This tourist activity occurs between the beginning of color changes and the onset of leaf fall." The Wikipedia article's more technical aspects are continued in the next section. 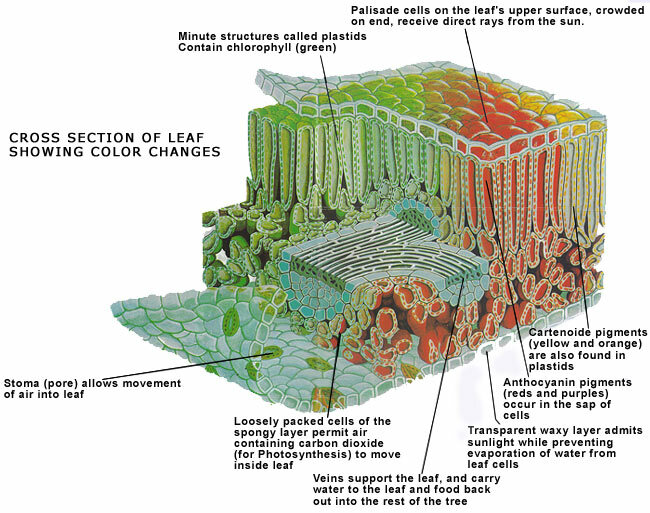 There are many excellent web articles and videos on the complex chemistry of leaf color change and photosynthesis. The extremely complex process of photosynthesis underlies the color changes. No way is it evolved! By the way, raw energy, like sunlight, CANNOT be transformed to do useful work, except by an intelligently MADE mechanism. Raw energy will NOT charge a car battery -- you must have a battery charger - made by some smart person. See my page on the Laws of Thermodynamics for more discussion. 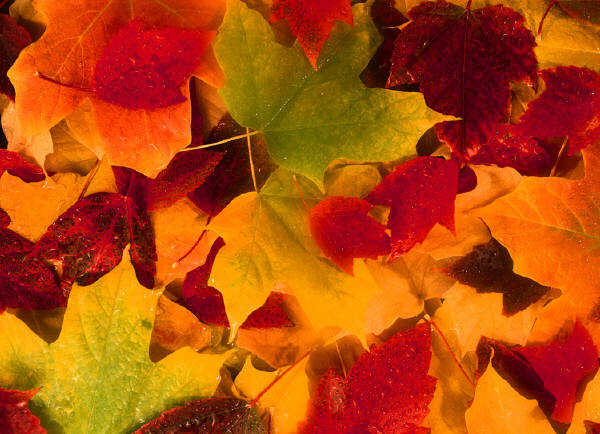 From the Science Made Simple -- Autumn Leaves and Fall Foliage - Why Do Leaves Fall Colors Change? 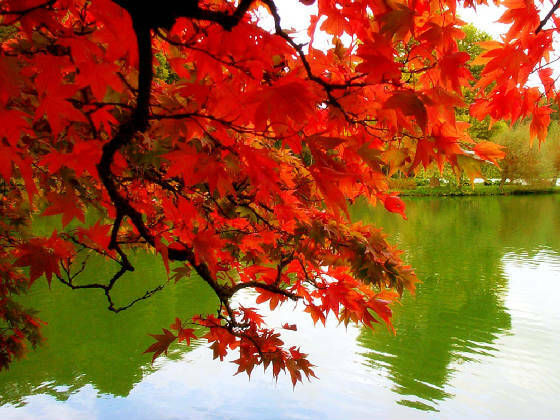 "Leaves are nature's food factories. Plants take water from the ground through their roots. They take a gas called carbon dioxide from the air. Plants use sunlight to turn water and carbon dioxide into oxygen and glucose. Oxygen is a gas in the air that we need to breathe. Glucose is a kind of sugar. Plants use glucose as food for energy and as a building block for growing. The way plants turn water and carbon dioxide into oxygen and sugar is called photosynthesis. That means "putting together with light." A chemical called chlorophyll helps make photosynthesis happen. Chlorophyll is what gives plants their green color. As summer ends and autumn comes, the days get shorter and shorter. This is how the trees "know" to begin getting ready for winter." Their entire article is well worth reading. Hank Green gets a bit dramatic, but really does a great job on YouTube -- ATP & Respiration: Biology #7 , Photosynthesis: CrashCourse Biology #8 (15 min each). Even if you are not technical, it is good to listen to Hank a bit, to see how complex photosynthesis is. No way is it a cosmic accident. Even these more technical presentations only go part way into the immense chemical complexities involved in photosynthesis. "A green leaf is green because of the presence of a pigment known as chlorophyll, which is inside an organelle called chloroplast. When they are abundant in the leaf's cells, as they are during the growing season, the chlorophylls' green color dominates and masks out the colors of any other pigments that may be present in the leaf. Thus the leaves of summer are characteristically green. Chlorophyll has a vital function: that of capturing solar rays and utilizing the resulting energy in the manufacture of the plant's food—simple sugars which are produced from water and carbon dioxide. These sugars are the basis of the plant's nourishment—the sole source of the carbohydrates needed for growth and development. In their food-manufacturing process, the chlorophylls themselves break down and thus are being continually "used up". During the growing season, however, the plant replenishes the chlorophyll so that the supply remains high and the leaves stay green. In late summer, as daylight hours shorten and temperatures cool, the veins that carry fluids into and out of the leaf are gradually closed off as a layer of special cork cells forms at the base of each leaf. As this cork layer develops, water and mineral intake into the leaf is reduced, slowly at first, and then more rapidly. 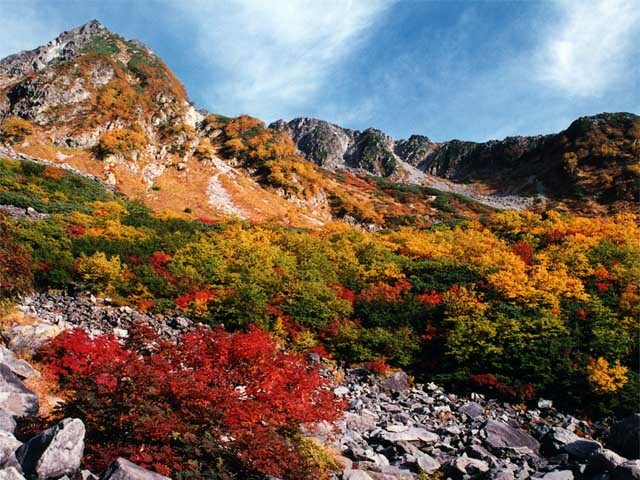 It is during this time that the chlorophyll begins to decrease. Often the veins will still be green after the tissues between them have almost completely changed color." 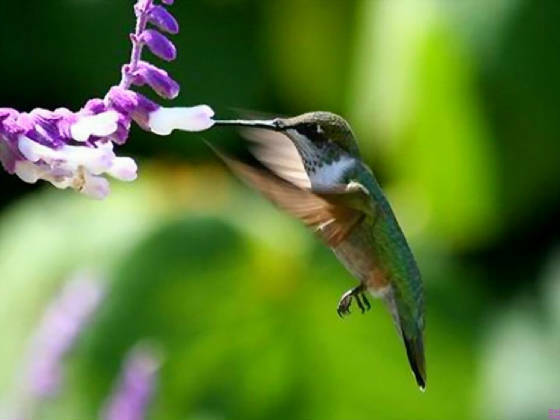 Please BEWARE that Wikipedia and others, because of their bents toward evolution, will try to argue, perhaps, defense against insects, or some such thing, as the reason for plants (ADAPTING) - evolving the colors or thus the change mechanism. They may present their "co-evolution" argument, as to how this change came about. This argument is wrong. Genetic mutations are virtually ALWAYS BAD in a natural environment. Mutations are mistakes, damages to the codes, caused by chemicals or cosmic rays. Good genetic mutations, and many many together, are demanded, as the only mechanism for evolution. That is - the only way their offspring will be better than the parents. But again, genetic mutations are virtually ALWAYS BAD, in the natural environment. Any supposed evolutionary changes require numerous favorable mutations, all compatible with each other, to occur by accident, so that the offspring will be intricately changed for the better. 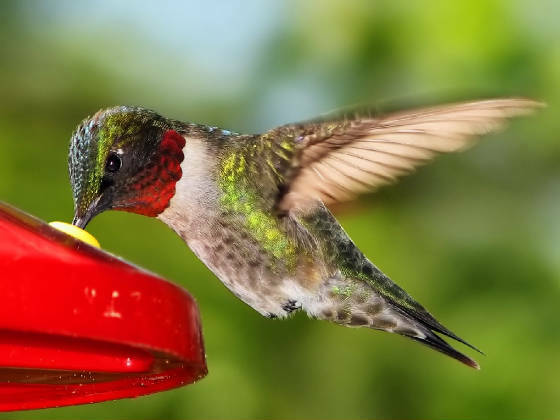 I covered this in my page on the Hummingbird. 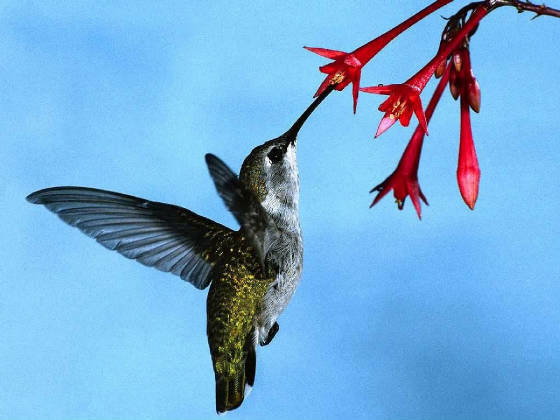 Long curved beaks and deep flower plants were argued to have co-evolved, together. Again, the odds are overwhelmingly against such luck. --- A monstrously long long shot.